No Mercy offers a great introduction to an amazingly diversely talented blues musician. People say being the son of a famous man is particularly difficult. Often times he reacts badly to being in his father's shadow and wilts under the pressures on him to succeed. It's bad enough when your father happens to be well known, but it must be a hundred times worse if he decides to follow in his footsteps in his choice of career. The only way this can work is if both men involved are sure enough of themselves and their abilities to not feel any threat from the other. The father is going to have to be able to teach his son without telling him to do it "my way" and the son is going to have to be willing to understand he can learn something from his father no matter how talented he is or thinks he might be. I'm sure it's hard when the son and the father are both professionals like lawyers or doctors and the son is always being compared to the dad to see if he matches up. But when you start venturing into the arts, where egos are notoriously fragile, it would seem like collisions are only inevitable. This only makes the case of Luther Allison and his son Bernard Allison much more remarkable for the way things turned out. Even when his father was alive Bernard was spreading his wings and putting his own stamp on the Blues. In fact his first CD, released in 1990 when he was twenty-five, was called The Next Generation. 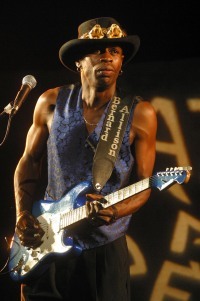 Being born in the early sixties, Bernard was not only exposed to the music of his father and his contemporaries in the Chicago Blues scene, he was listening to the modern interpreters of the Blues and rock players. 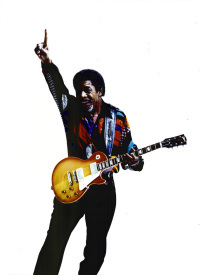 There's no question the father would have influenced the son, but if he wanted to be Bernard Allison and not Luther Allison's son he was going to have develop his own ways of playing and interpreting the blues. Those just aren't idle words, spoken to deflect any possible suspicion of Bernard riding on his father's coat tails. All one needs do is listen to him for any length of time to dispel that notion and to realize he's his own player. No Mercy is a packaging of two live concerts onto one disc, and it give a really good indication of not only Bernard's talent but his diversity and passion as well. Not having heard much of his music before I wasn't sure of what to expect, and when the opening track, a cover of B.B King's "Rock Me Baby", sounded like it owed more to Hendrix than anyone else I was a little concerned. Not that I don't like Hendrix, but even he never did an album without slowing down occasionally and there are far too many blues guys who equate speed with emotion and passion. Slowing down does not mean stop playing and do a token power ballad like so many rock bands have done in the past, it means learning how to play the incredible variety of Blues styles out there and making them sound like your own. The Blues, like Jazz and Orchestral music, has always lent itself to interpreters; people who can take an older piece of music, put a fresh coat of paint on it, and make it sound brand new. Not only is Bernard Allison fully capable of that, but he also maintains the original integrity of a piece. Listening to his version of "Break'in Up Somebody' Home," the third track on the disc. He comes down off the boil of the first two songs, and pulls the listener in with guitar restraint instead of excess. It's an example of how a good player can make less have more emotional power. Whether it's the almost boogie feel of "Driven Wheel" or the more solid fare of Chicago blues that he serves up on his father's "Change Your Way of Living" Bernard proves he's more than just a speed merchant looking to tear his way through songs like tissue paper. He can lovingly coax out of a piece of music the subtle nuances that can elevate the Blues from simplicity to complexity, no matter the song or the style. When you are interpreting someone else's work, be it as a musician playing in a style far older than you, or an actor performing another's words, the biggest barrier between success and failure is the size of your ego. The more the performance becomes about the music and/or the words, and the less it is about you, the better it is. The problem is it takes a certain amount of ego to even just get up on stage and believe you have something to offer in the first place. The great performers are able to find a balance between being aware of their talent and knowing they aren't God's gift to anything. You can usually tell by their unwillingness to let anything speak for itself, be it song or soliloquy, but the biggest clue is how they feel about sharing the spotlight. In the case of Bernard Allison he understands being surrounded by good musicians won’t make him look less talented, but will make him look better. His band for the concerts recorded on No Mercy is amazing. Keyboards have replaced rhythm guitar to good effect, especially when doing some of the older, honky-tonk type songs where nothing can replace a barrel house organ sound. They also offer a nice counterpoint to the staccato nature of the blues guitar solo; a wash of sound underneath that supports the melody, much like the bass and drums support the rhythm. Although Bernard Allison is most definitely the leader of the band, they are still a band, and they work together on making the songs work. Unlike a power trio where the bass and drums sole purpose in life is to support the work of the lead player, here everyone contributes a key element to the song that enhances the experience for the listener. Bernard Allison probably knows more about Blues music then any of his contemporaries just because of who he is and who his father was. But instead of being happy, or lazy enough to rest on those laurels, he has pushed himself into developing a style of his own that reflects all the influences on his musical life. If you are not overly familiar with his work, then No Mercy offers a great introduction to an amazingly diversely talented blues musician. Not only is he keeping a tradition alive, but he definitely is blowing new life into it.